River crossings, mosquitoes, bog, hard scrambling and impenetrable trees - Klosterdalen was the hike from hell but the landscape was magical. By the time we set off up Klosterdalen the morning was well underway. The temperature had risen, the dew was gone and the mosquitoes were out in force. 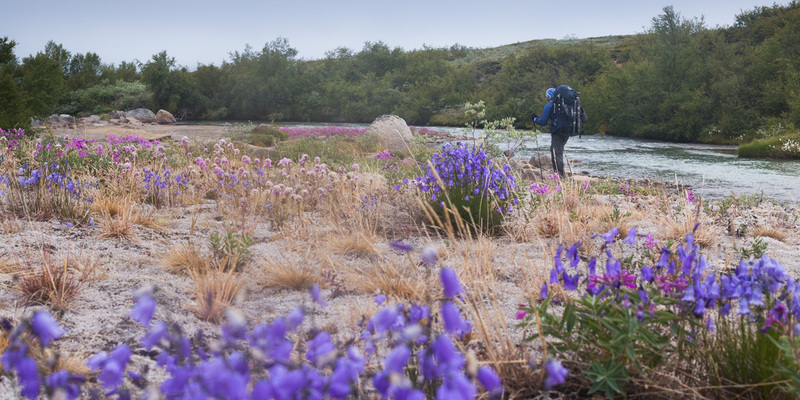 I’d never had to deal with mosquitoes before I reached Greenland. My hopes that they would merely be annoying were gone as soon as we landed, but it was in Klosterdalen that I really suffered. 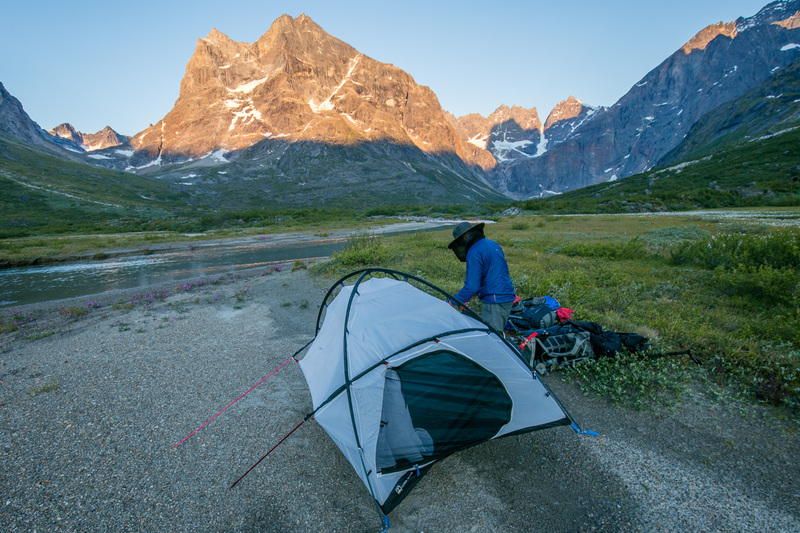 Harsharn has a snack before setting off – the swarms of mosquitos stayed with us. Skin tight merino base layers were a bad choice (channels Ron Burgundy) – they bit straight through. The synthetic trousers I was wearing offered some resistance but not enough. 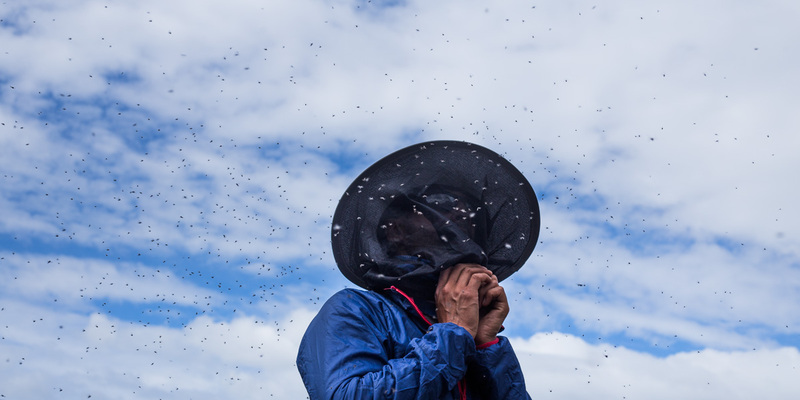 My hat, specifically designed to stop mosquitos left me with a ring of bites around my forehead. But what really surprised me was their ability to bite me through my fleece. The only thing that gave any real protection were waterproofs and Deet (which incidentally melted my watch). As Harsharn put it: “You feel like a prisoner in your own head net”. So, boasting to Harsharn about how much more ‘delicious’ I was, we cached our extra food and packrafts and started walking. 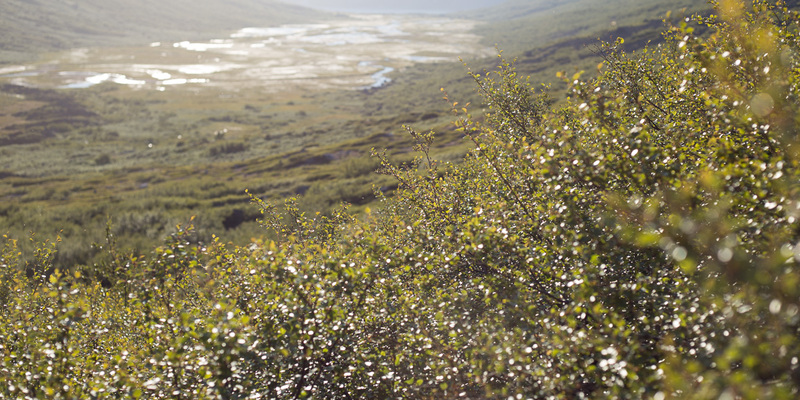 The first few hundred meters were across easy tundra before we tried to cross the river. Neither of us selected particularly good crossing points, but Harsharn certainly learnt that ‘deep and fast’ was never the choice to make! Where not to cross a river! Although the river was fast and cold it wasn’t dangerous. Thick moss covering the bog. The route continued through the bog and cotton grass we had seen from above the night before. It made things a little tougher and we started to hope for dry ground. We should have enjoyed it whilst it lasted. We hiked over bog and through trees for the majority of the route. As we approached a lake we were forced into the trees – there was nowhere else to go – and so began the hardest hiking of my life. The birch trees grew impossibly close together and as we ploughed on we regularly tripped over unseen low branches. The ground was uneven and the long grass hid small streams which we inevitably plunged into. 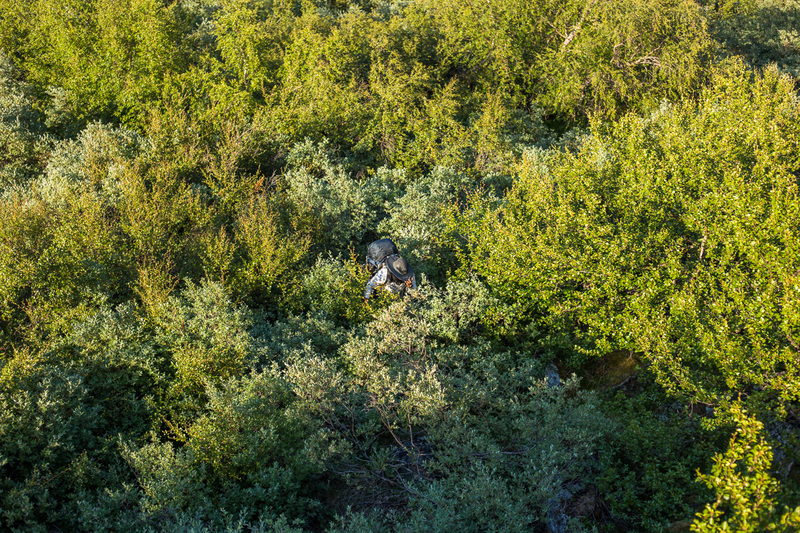 From time to time we would find our way out of the thicket only to be forced right back in again by a stream or pool. It was a demoralisingly slow full body workout. Hasharn battles his way through the birch trees. My size and weight definitely gave me an advantage! All the while the mosquitos remained, later joined by swarms of small flies. Resting was as bad as continuing – when we stopped for lunch we had to pass food up through the mosquito netting to avoid mouths full of flies. Leaving uncovered skin was suicide. It was a beautiful sunny day surrounded by spectacular scenery. I hated every second. 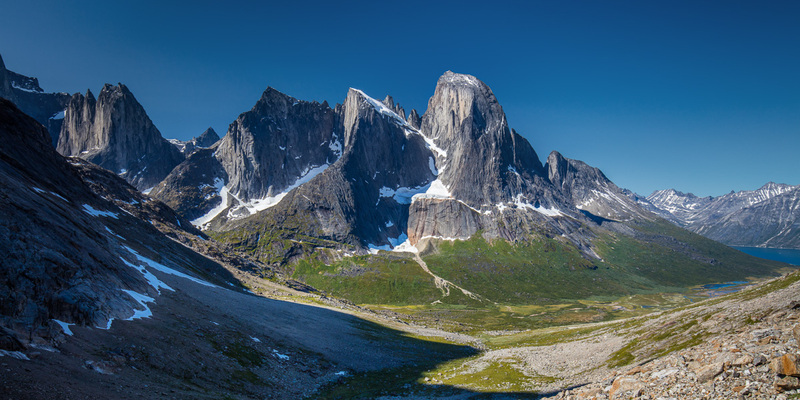 More unnamed peaks (to my knowledge) at the end of Klosterdalen. Eventually we met open ground and revelled in being able to stride out. We crossed the river and went straight back into the trees. The river crossing before reentering the trees. By the time it was over we had covered 5km in 5hrs but we were on our way up and free of the trees for good. A cooling breeze came up from the fjord chasing away the last of the mosquitos. We started to enjoy ourselves. The final 300m or so of the climb took us across steep granite slabs and though a boulder field of bus sized scree. Granite slabs on the way up the pass. The horrific hike was behind us now. We made camp near the top of the pass surrounded by tiny streams of the purest water you could hope to find. Opposite was the Ketil massive, it’s granite spires giving a prehistoric feel to the landscape. This was wild mountain scenery, true wilderness and a just reward for our efforts. 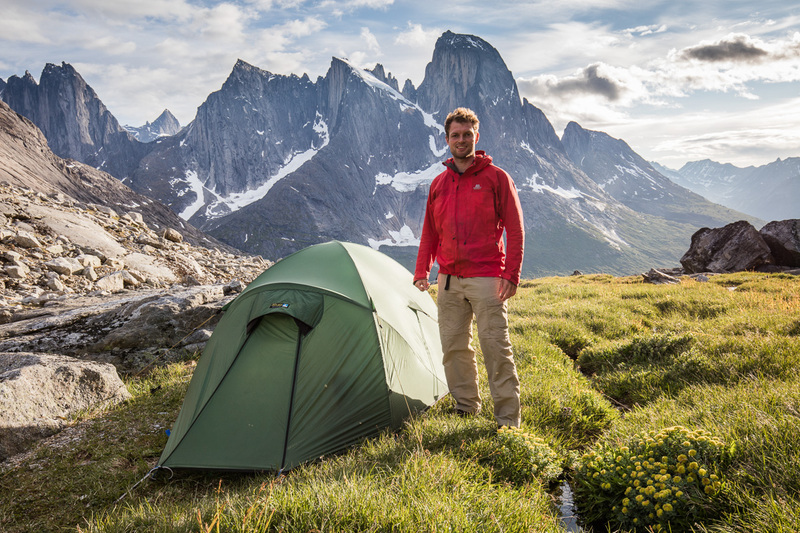 I love setting my tent up in remote locations and this was right up there with the best of them. A short walk onwards over patches of snow took us to a view down the other side of the pass over a high mountain lake. Above more unbroken granite walls soared into view. We had moments of nice light that evening, but not the kind of drama we had hoped for. Nevertheless the scenery was inspiring and we retreated to our tent happy to be at such a magical and remote location. Sunrise was cloudless. I set up a time-lapse to capture the light pouring down Ketil. Feeling that this place was particularly special I convinced Harsharn to stay longer, optimistic that the light would improve. We relaxed that whole day and washed our clothes. Sometimes the mosquitos would reappear, but otherwise we just chatted and played cards. Airing the sleeping bags on top of the tent. When camping for long periods you need to take care of your gear. Blue sky days are often hard to work with photographically, but when the air is clear they can be quite beautiful. The dreaded birch trees – AAAAAARRRRRRGGGHHH!!!! Often I lost sight of Harsharn in the trees and we would shout to each other. He said these trees were ‘next level’. By late afternoon it was evident that it would remain cloudless. 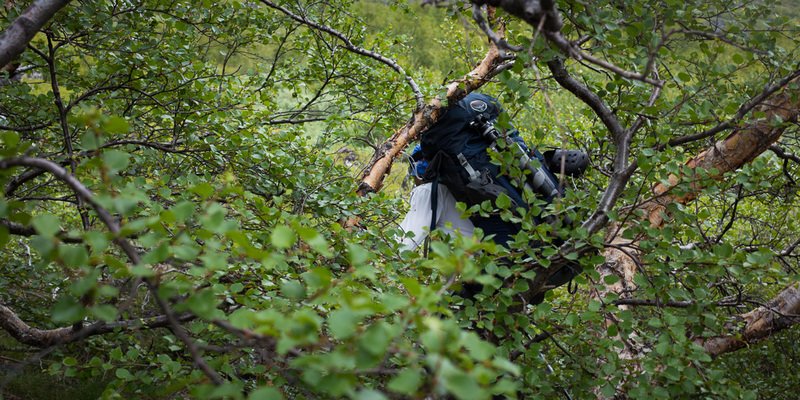 We headed back down through the hell of the previous day finding the trees higher and more impenetrable than before. We made camp on a sandy area, leaving 5km to cover the following morning. 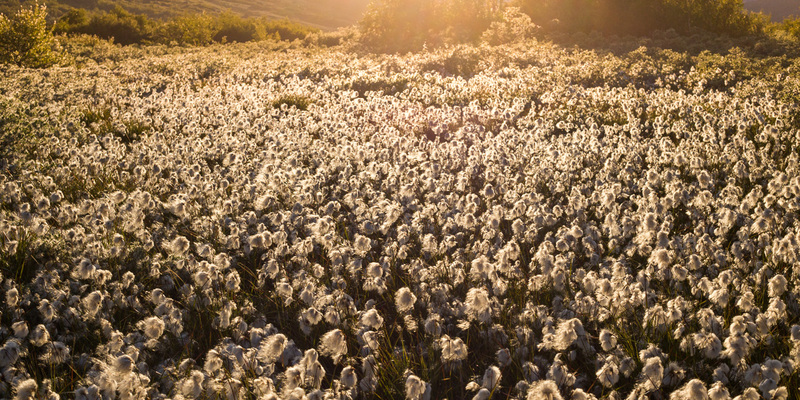 We came across vast fields of cottongrass. Setting up camp on the sand, we didn’t guy the tent out that night, there wasn’t a breath of wind. 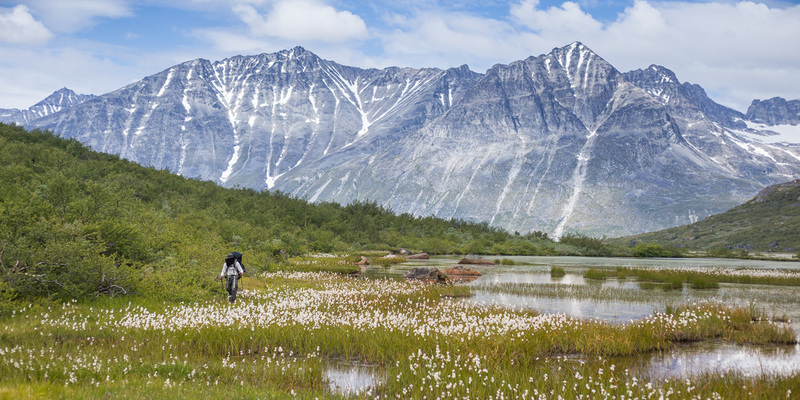 One of the many lakes in Klosterdalen lined with Cottongrass. We packed up and set off before sunrise eager to avoid the mosquitoes which would inevitably emerge as the day warmed. By complete luck we found ourselves following a feint old trail through the bog. Heavy dew coated the grass saturating our legs as we walked. Harsharn trail blazing through the dew, I really love this image but sadly it’s a bit blurry! 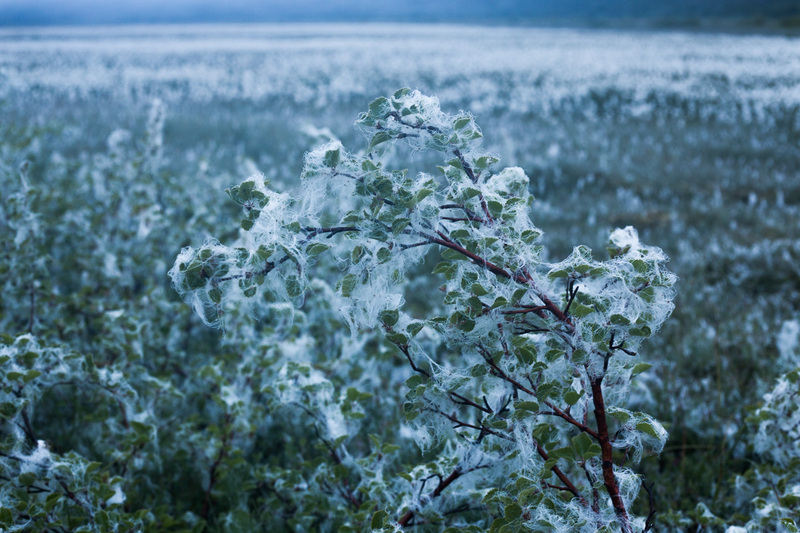 The wind had coated some of the birch bushes in cottongrass. The moment the sun first hit the peaks above the clouds formed and the mountains did a disappearing trick. We walked fast, not sure of how far we had come. As time passed we wondered if we had reached the lake and how we had managed to avoid the trees. We walked further on, hopping through the bog and still there were no trees. The final stretch back to the cache took us alongside the south bank of the river. We crossed at the fjord. 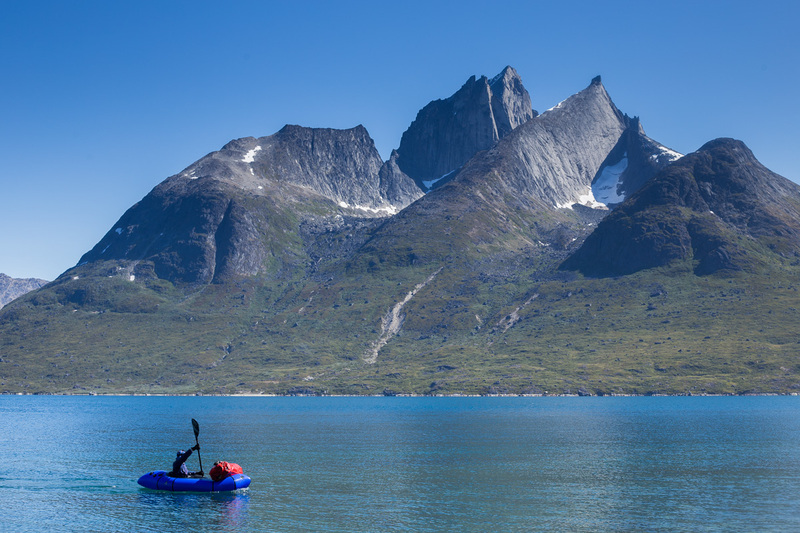 Maewan – The Adventure Base in Tasermiut Fjord. We ate a late breakfast, inflated the boats and headed onto the water. There was a sail boat in the fjord and I paddled out to say hello. A French man and woman invited us onboard and offered us a cup of coffee – welcome after an early start. Their boat was ‘Maewan – Adventure Base’. They told an exciting tale of their journey past the Faroes, onwards to Iceland and then the coast of Greenland adventuring as they went. The two of them were currently looking after the boat whilst a team climbed Ulamertorsuaq. When planning the trip crossing the fjord was a concern, strong winds would make it impassible. In the end it was child’s play. Paddling in front of Ketil. We said our goodbyes and paddled across to the opposite side of the fjord to capture the views we had missed at the start of the trip. As we paddled the clouds broke up revealing the peaks above. We camped in exactly the same spot as our first night. 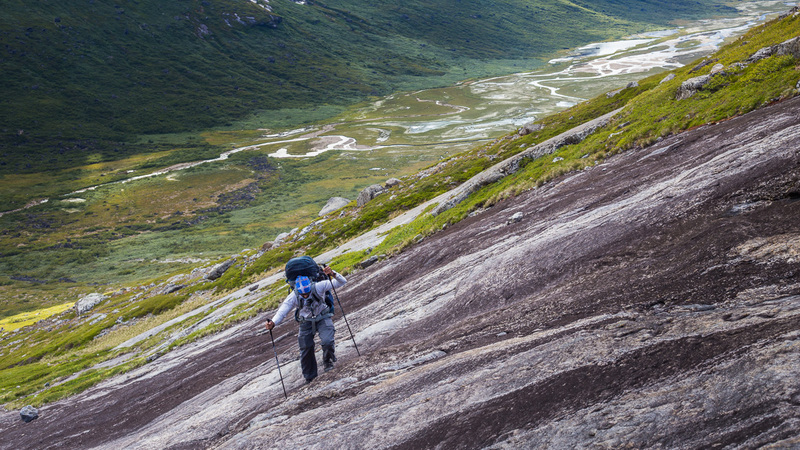 Hiking on smooth granite was easy – in marked contrast to Klosterdalen. That evening we hiked up the river, finding an ideal route up smooth granite that the stream must have flowed over when it was in spate. Part way up we found a deep pool beneath a waterfall and with plenty of time to spare I jumped in for a dip. The water was icy but refreshing. I had to be a little careful though – the current was strong enough to pull me over the edge! 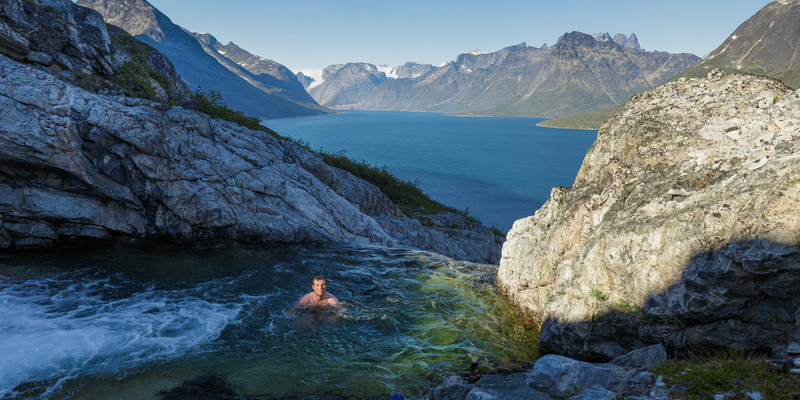 Swimming beneath a waterfall above the fjord, the water was icy but I felt fantastic afterwards. From a few hundred meters up the views were outstanding. For the first time in my photographic career I had started to come to the realisation that the trip was more about the experience than the photography. Nalumasortoq a unique mountain. I love the ‘M’ in the middle! 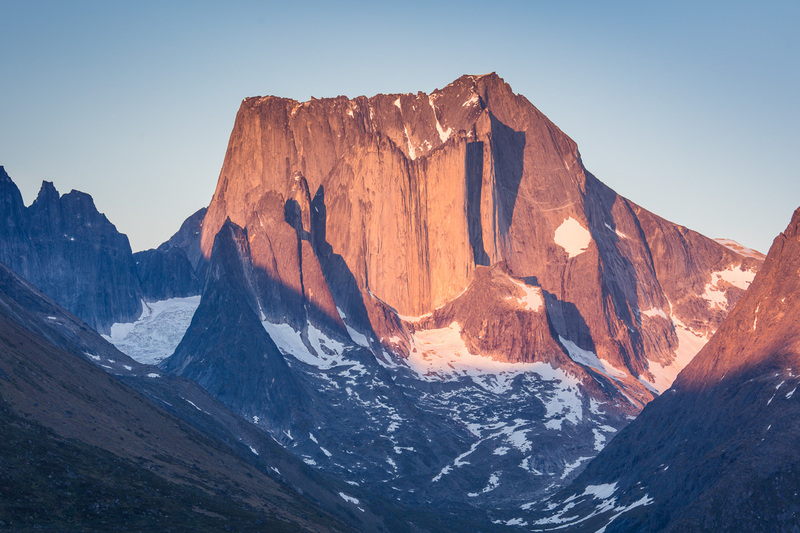 Ketil, Nalumasortoq and Ulamertorsuaq dominate Tasermiut Fjord. Their granite rock walls are a haven for climbers and make for compelling photographic subjects. 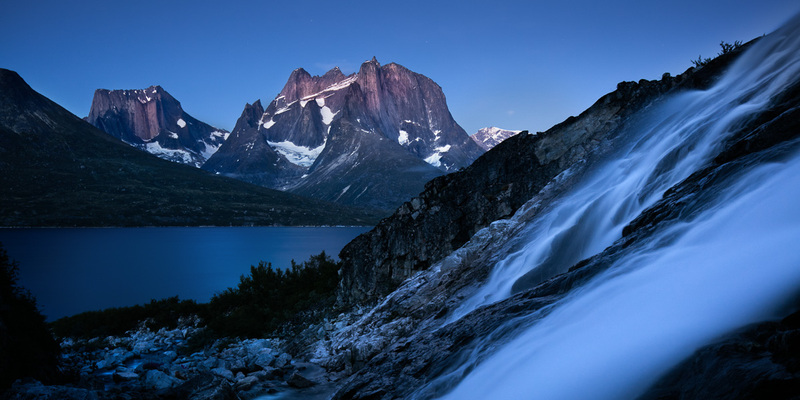 A waterfall on the opposite side of the fjord to Ulamertorsquaq at twilight. The sun came down through cloudless skies and we watched the light disappear from the highest peaks before heading back down to the tent. We lit a large fire and cooked restaurant sized mussels we had collected that afternoon. Mussels rounded off an excellent day. 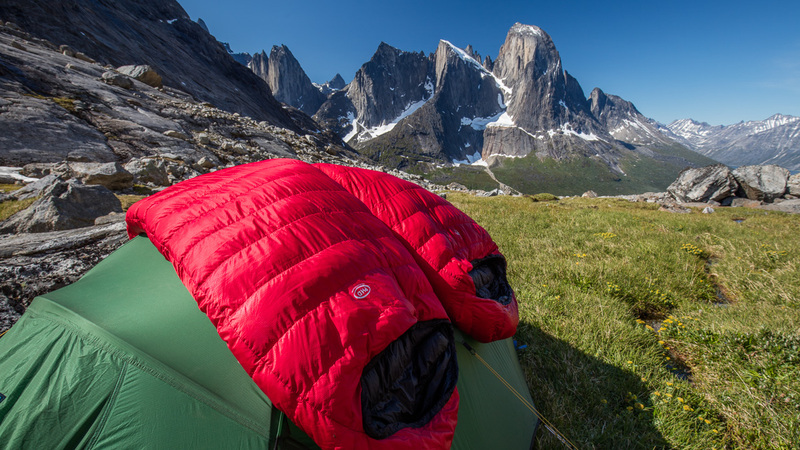 Written by alexnail, posted on 18th February 2016 at 3:58 pm, in Trip Reports and tagged backpacking, greenland. Permalink. RSS feed for this post. I really enjoyed your report. A horrible adventure, but great landscapes. 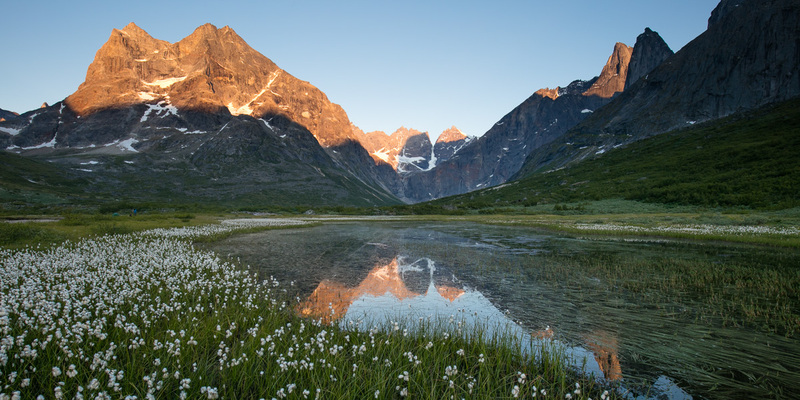 Maybe boating up fjords with judicious hikes is the best method to avoid mosquitoes, bogs and birch woods. Absolutely, boating in the fjords makes by far the most sense, but it’s hard for me to argue that the hikes weren’t worth it, mozzies and all! A great report to read, and I can feel your sense of elation as well as frustrations through the article, and yes I completely understand when you say it is so much more the experience than the photography. Great story telling too here Alex. Thanks Andy, much appreciated. I think it helps that I kept a diary throughout the trip! 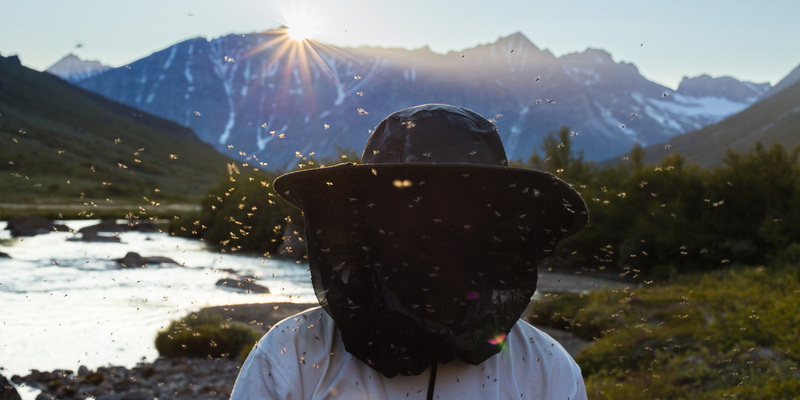 eeck.. i really hate swams of mosquitos.. we get them in cyprus around sunrise/sunset in summers.. it’s 30 minutes of torture.. however it seems to go on all day in greenland unless you are high up.. They would be my number one concern if I went back! The mosquitos would of finished me off, and what a hike! ?…full respect Alex for not taking the easy route getting close to nature and daring to go somewhere Seldom seen.. Great pictures. Cheers Terry, can’t wait to do something similarly exciting again, although perhaps not this year! Amazing photos! Especially the one with the mosquitoes. Unique!!! 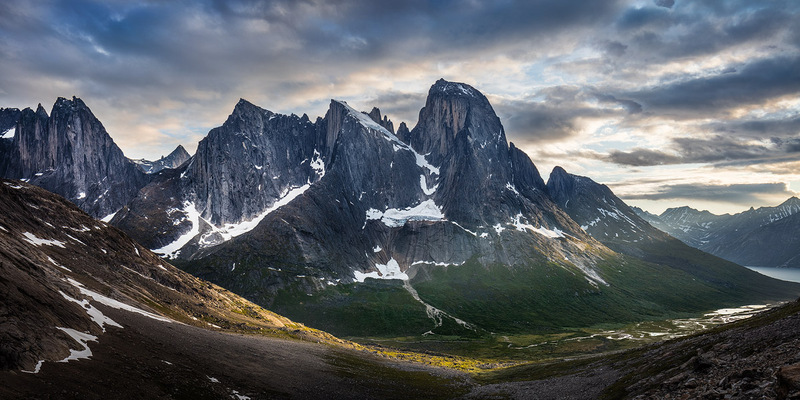 I’ve always wanted to visit Greenland and take pictures of its wilderness. 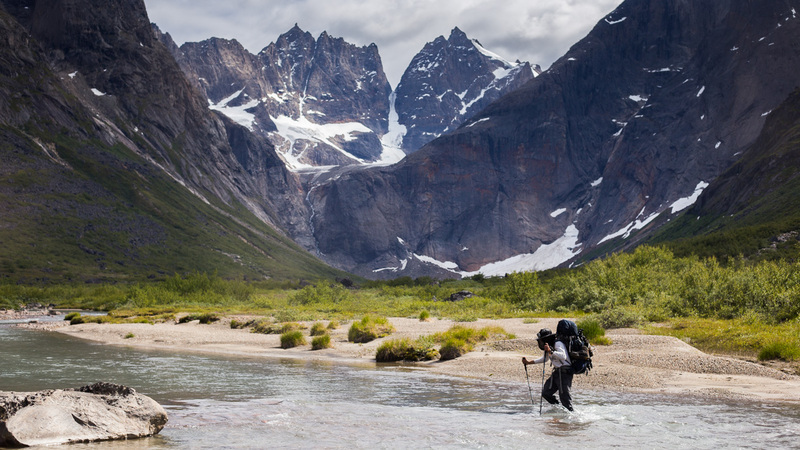 Fantastic report of your trip, makes me want to be there (apart maybe from the mosquitoes…). Great timelapse film as well! Is there going to be a part three of this report? 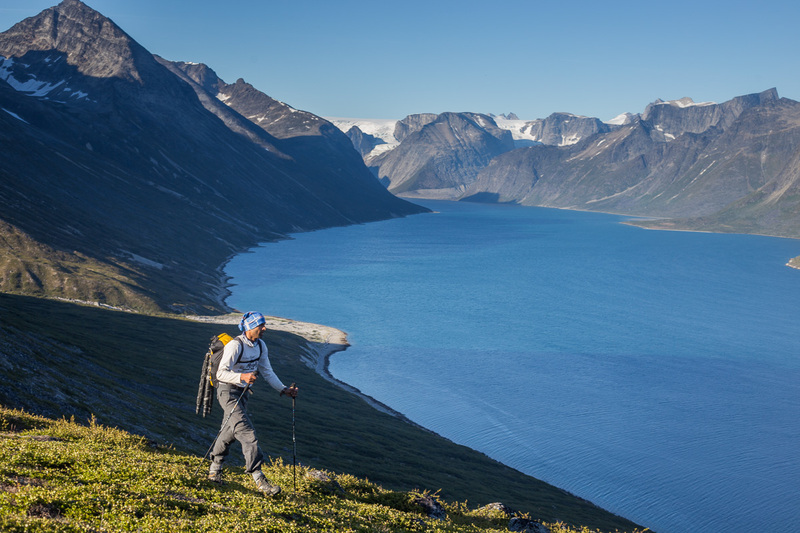 Do you know if it is possible to hike all around the fjord without packrafting/kayaking? I don’t feel very comfortable being on the water alone in this wilderness, especially when the rescue possibilities are limited.